Baze and his Silly Friends have created The Best Day Ever!. Your kids will be dancing around the house for hours with this new CD. My kids had a blast listening to these tunes. If your looking for some new up beat music to get your toddlers dancing, this is the one. They will be asking you to "play it Again Sam". We really enjoyed the music on this CD. We had the best day ever! 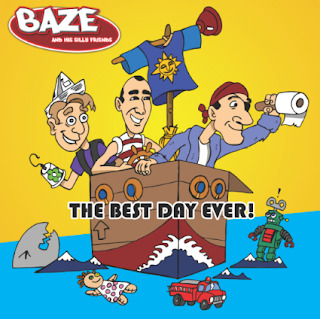 Would you like to win a copy of Baze & His Silly Friends? Tell me what children's music is so important to you. I love children's music because it keeps them occupied in the car and they love learning the songs! follow on instagram as taverstables. thanks! I do not let my kids listen to music with lyrics meant for adults, which means we never have the radio on. I like My Springfield Mommy on facebook. It teaches them to sing and have fun. My girl's church children's music is important to me. As part of their Sunday school program they were given children's songs that teach verses and stories. I follow Baze & His Silly Friends on Facebook under the username likwan. Children's music is so important to me because it's fun and wholesome. I tweeted about this giveaway on Twitter at https://twitter.com/likwan/status/402251456989757440. I shared this giveaway on Facebook at https://www.facebook.com/likwan/posts/10151792500462817.